These are our own personal riding mounts. We have put tons of miles on each and are very proud of them. 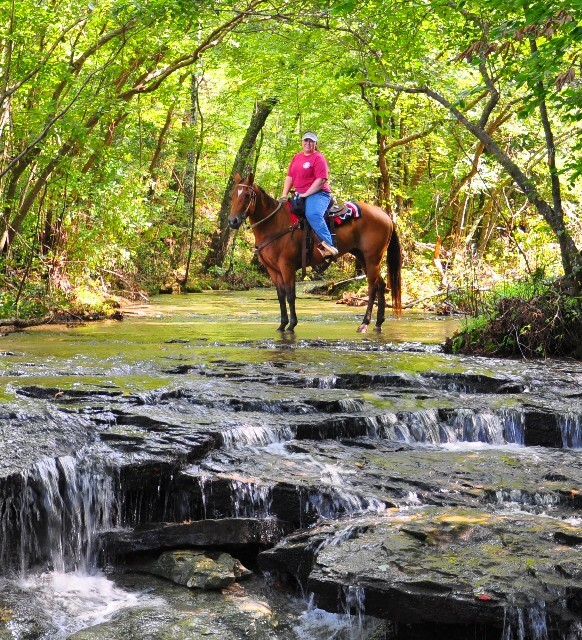 We look forward to the many happy trails and hours under saddle...to come. Yes, I know there's alot! We like to breed, raise and ride our own, so we always have some projects and some upcoming youngsteres to replace the older ones. 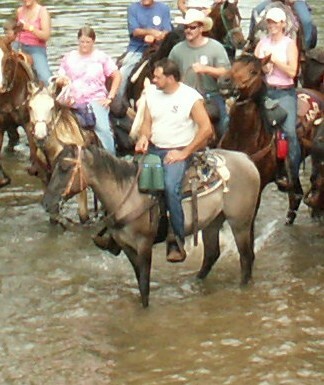 Plus with a large family that everyone enjoys riding, we have to have alot to chose from. These boys are not for sale, please do not ask. If I do decide to offer someone for sale, they are moved from this page to our FOR SALE page and you can always check there. "Life ain't always beautiful, but it's a beautiful ride! 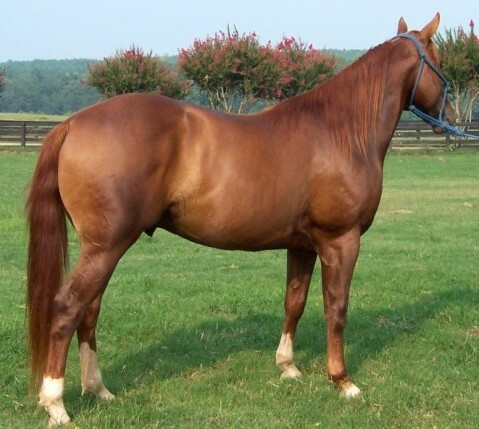 Spoky (Spook) 1989 AQHA Bay gelding that is a g-grandson of Leo and is high percentage foundation bred. 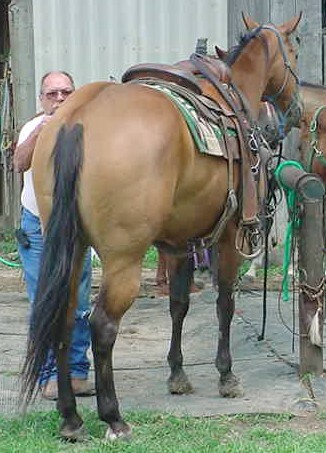 Unlike his name suggests he is a trusty mount who can carry a small child with great care and concern and then turn around and run barrels, team rope, etc... He is a great athelete as wide as he is tall and very lovable. Oh yeah, he will eat your lunch sandwich, chips, and all if you let him. Spook has come home from his youth rodeo/trail days to retire here at Circle S. Of course he will still be ridden, just not as much. And mainly by the greenest riders we have. 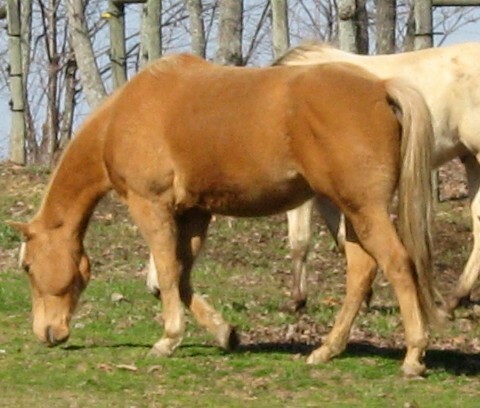 Buttermilk Buckskin gelding. 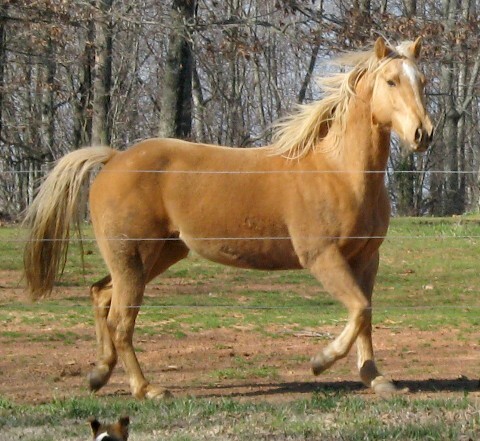 He is a grandson of Doc's Solano with Senor George, Hollywood Gold, Tinhorn Doc x Poco Tivio, and Royal King breeding. He is super athletic and trusty. And watches out for you on those up and down hill climbs. He has also been to the pen a few times and is very cowy. This is one you can trust your life to. He never faulters on the trail and will go anywhere and do anything. I have been greatly blessed with this boy! 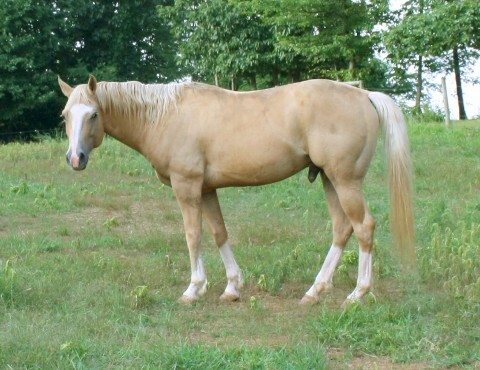 Docs Peppy Two Eyed(Hollywood)- 2000 AQHA Deep palomino gelding that is a great grandson of Blondys Dude and is Mr Gun Smoke and Two Eyed Jack bred. 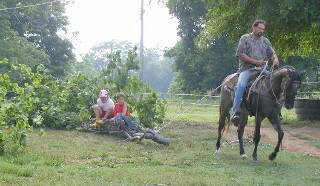 It seems that he will have a lifetime home here, since he will do anything and will ride anybody. He is a dream to ride and has done a little bit of everything. Loves to compete and is atheletic. We have even sent Hollywood to a 9 year old girl and let her compete in barrels, pole bending, and goat tying for many months! 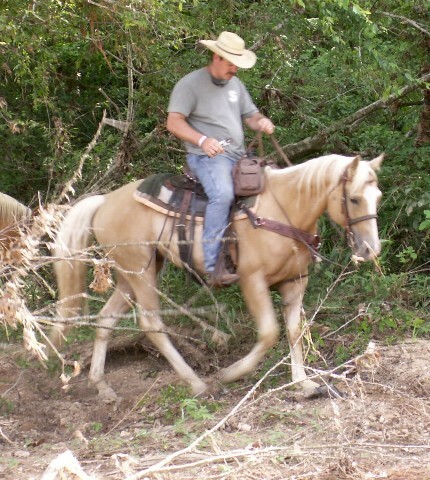 Then when they found her a replacement horse, he came back home and has been to many trail rides since. Lucky Genuine Cowboy(Cowboy)- Don't know where his size came from. 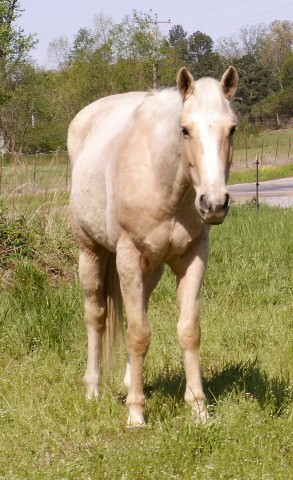 His sire and dam were 15 and 14.2 and Cowboy is now 15.2! 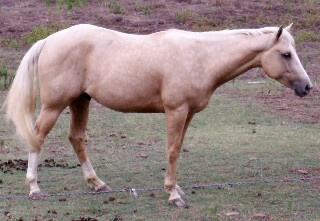 2002 AQHA Palomino Gelding by Luckys Raindance Kid. and Genuine Bama. He is Wimpy Don, Skipper W, Leo, Genuine Doc, and The Ole Man bred. We had the opportunity to get this young guy back when he was a two year old and couldn't pass him up. 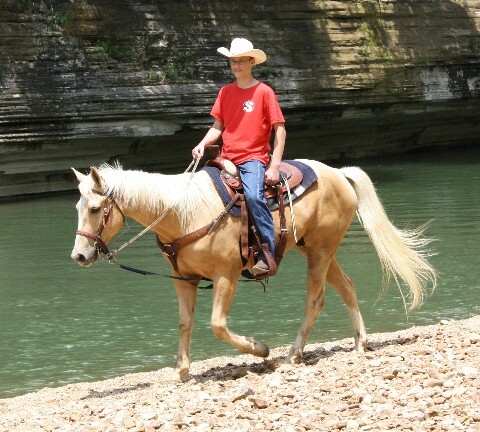 Cowboy is an amazing riding horse and is very calm and laid back. Good for un-experienced folks to ride. As a 3 year old we put my "green" 11 year old nephew on him and they have been a awesome pair ever since. 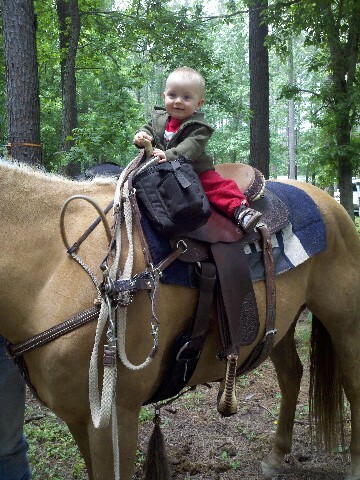 He has pretty much become Caleb's horse and they have a long friendship and many rides to come. 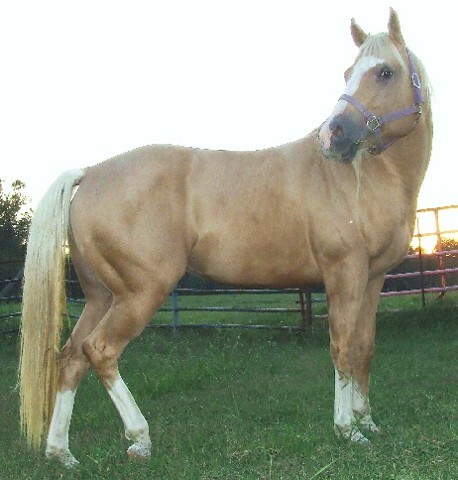 Ima Peppy Outlaw(Cisco)- 2002 AQHA Palomino Gelding by Luckys Raindance Kid and Little Peppy Cara. 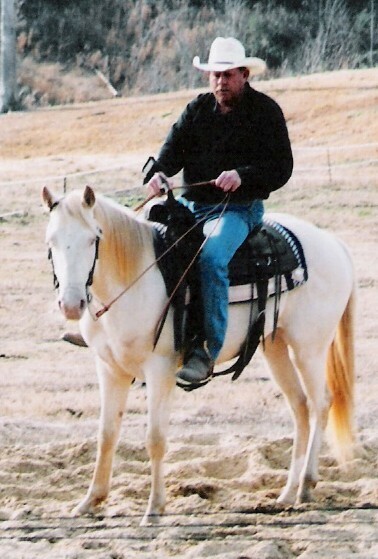 He is Wimpy Don, Skipper W, Leo, Wheeling Peppy, Doc O Lena, Coy's Bonanza and Two Eyed Jack bred. We had the opportunity to purchase this young guy back when he was a two year old and we couldn't pass him up. Cisco has been ridden by small children and kids and is super calm. Wes tried him out on the trails when we first bought him back and has fallen in love. Cisco has more heart that anything we have ever seen. He WILL do anything you ask of him. if you point him in a direction and ask him to go, he will make it or kill himself trying. He is assured a lifetime home here. Hopefully he'll do for our kid's one day. 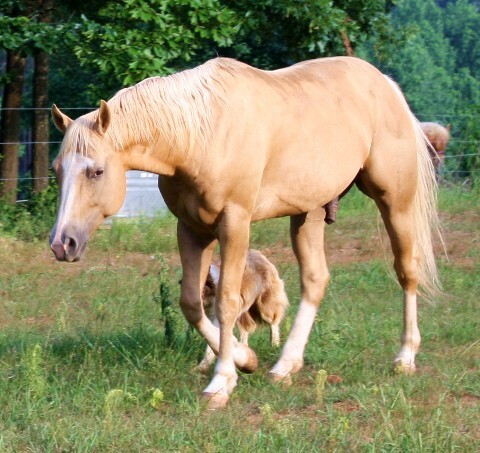 Lucky Chance Kid(Chance)- 2003 AQHA Palomino Gelding by Luckys Raindance Kid and Enchantrance(outside mare) He was born and raised by some friends of ours who live in Boaz, AL. 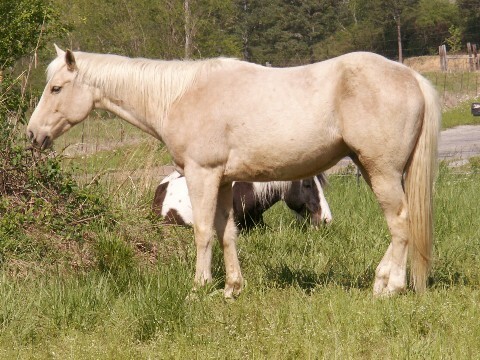 They kept him as their stallion for several years but decided to thin down some and offered him to us for sale. 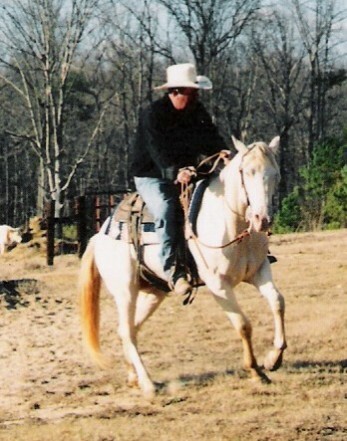 He has a good foundation under him and was broke to ride. He has great manners and is quite the gentleman. When we were offered the opportunity to purchase him back; we jumped on it. 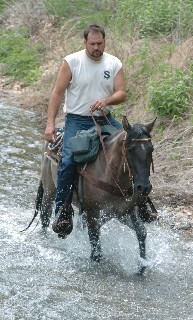 He rides well, has a great smooth trot and lope, and is Wes' new mount.. Chance went on his first big ride in May 09 and did well. 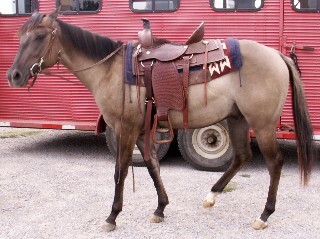 Tough Silverado Ace(Tough)- 2004 AQHA Grulla Gelding. We purchased Tough when he was just a few days old, straight off of his momma in Kentucky. 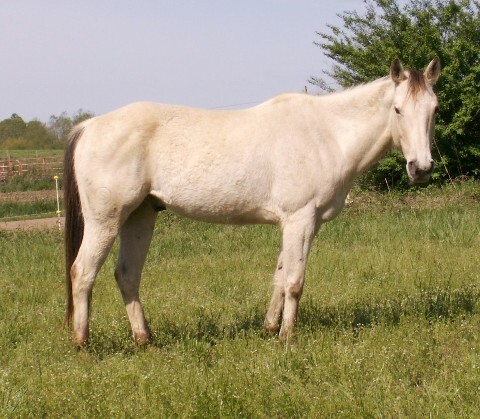 We had always loved the grulla color and really wanted a foundation bred grulla stallion for our program. We raised him up, sent him to be broke, and he rode out really calm and level headed. 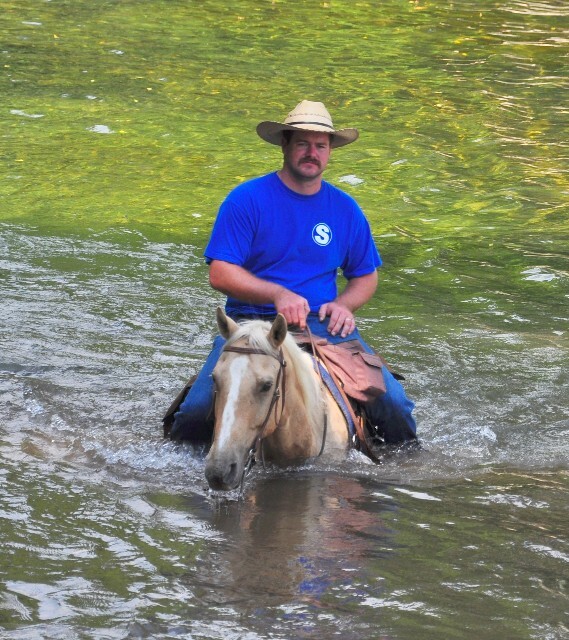 He even did some Cowboy Mounted Shooting before he came home to start his career as one of our sires. He foaled only duns for us, and only fillies:). Then over the years we were offered the chances to purchase his full brother(2007), his half sister(2008) and finally his mother(2009). 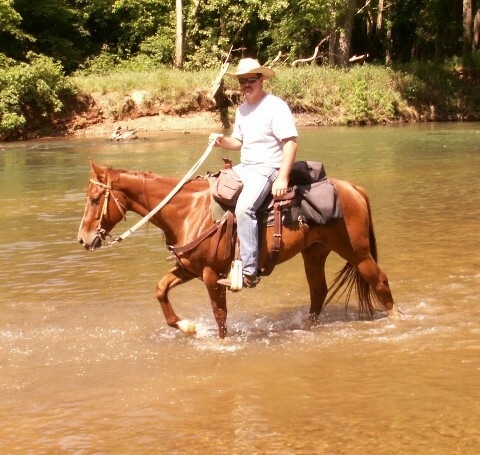 He was gelded when we started thinning numbers and now he is one of Candi's main riding horses. 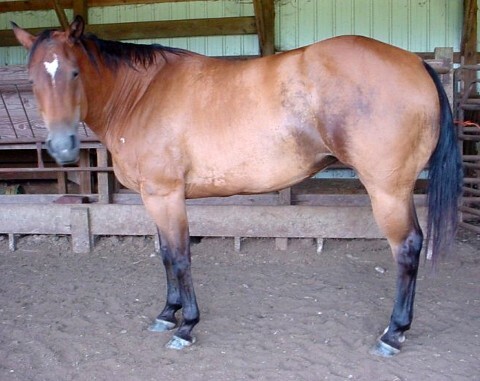 Luckys Hustler(Hustler)- 2003 AQHA Perlino Gelding by Luckys Raindance Kid and Hustlin On The Border(outside mare). 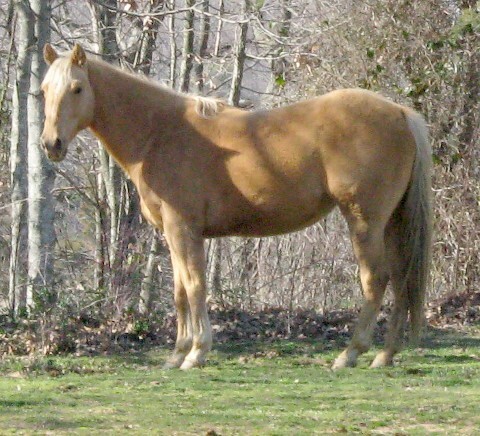 He was born here at Circle S and raised about 10 miles from us, where he was their main stallion. He was in cutting training for 2 years and even went to a few cutting shows before he was pulled out due to financial reasons. 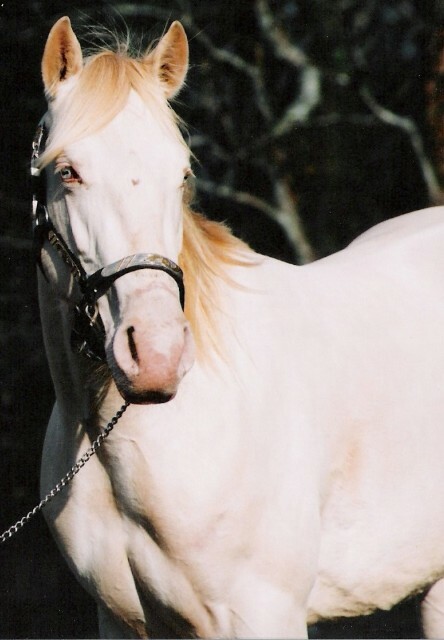 He sired several outstanding foals, many have gone on to ride excellently. 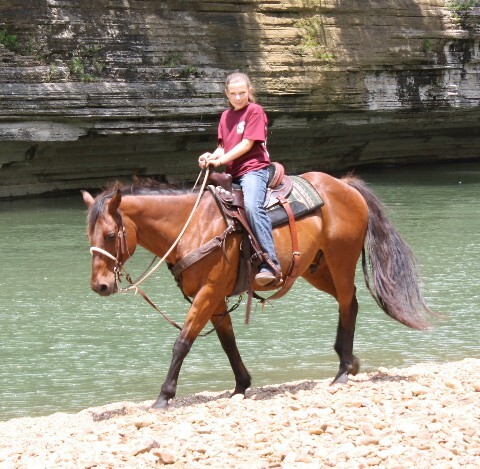 We were offered the chance to purchase him back in the Spring of 2010 and decided he would make a nice riding horse for us. 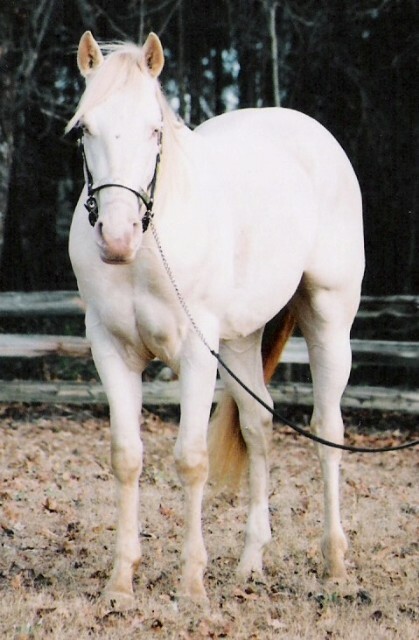 Pecoso Rose(Rose)- 1994 AQHA Bay Mare She is a grandaughter of Doc's Prescription and has Colonel Freckles, Leo Bingo, Doc Bar, Leo and King on her papers. Can you say "Cowboy Cadillac"?? :) She is that one in a million. We usually don't ride mares, as it is easier to let them raise foals and then have the geldings we can go and do with whenever we want. But we have made an exception for this wonderful gal. 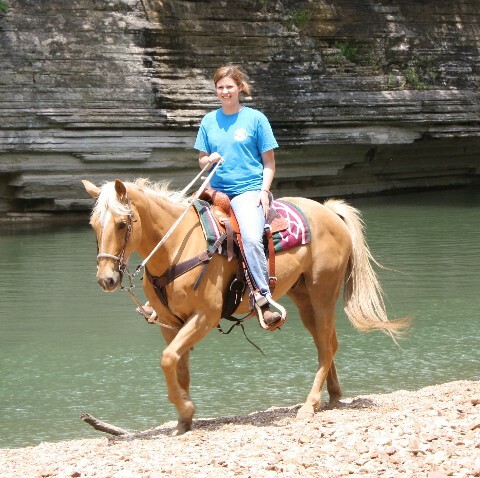 She has won over $10,000.00 in open team penning, sorting, ranch horse versatility, and is a super kids trail horse. 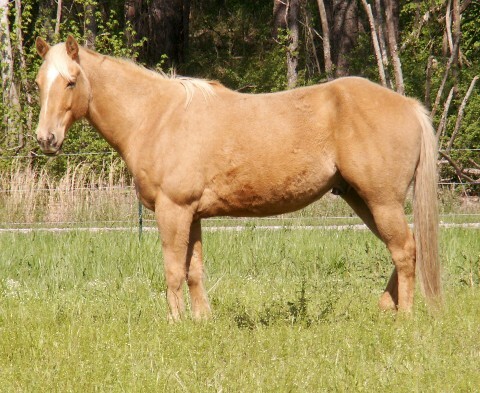 She also has had 4 foals, a stud colt and three fillies. 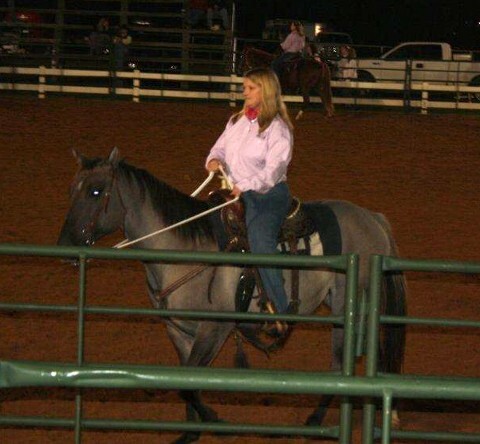 The two older ones have both earned money in penning, sorting, and ranch horse and 1 won money in NCHA. 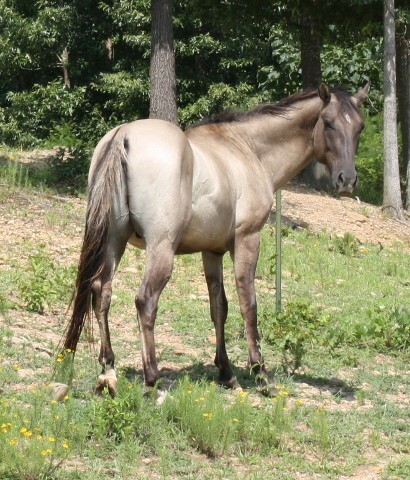 We have trail ridden her and she is a dream. 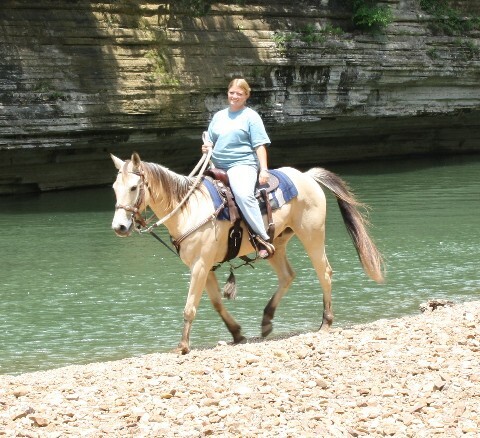 She is great for the "new" riders and my niece Amanda rode her 6 days Sept 2009 on a weeklong trail ride. 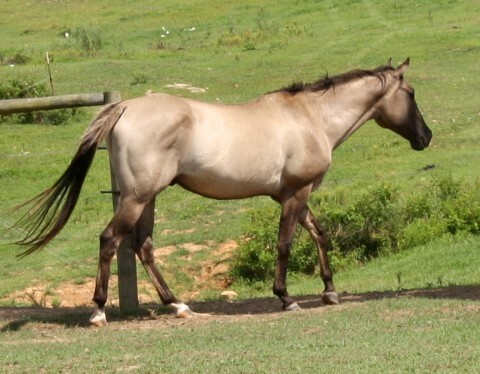 Rose foaled us a gorgeous buckskin filly by Luckys Raindance Kid in 2011 and has been placing my husband in team sortings summer of 2012. 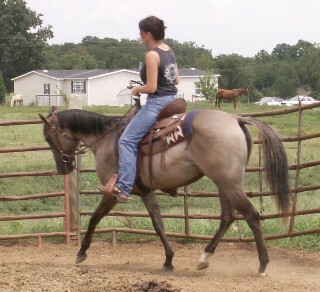 Luckys Lil Scout(Scout)- 2004 AQHA Sorrel(dun factored) Gelding by Luckys Raindance Kid and Lil Boston Jackie. 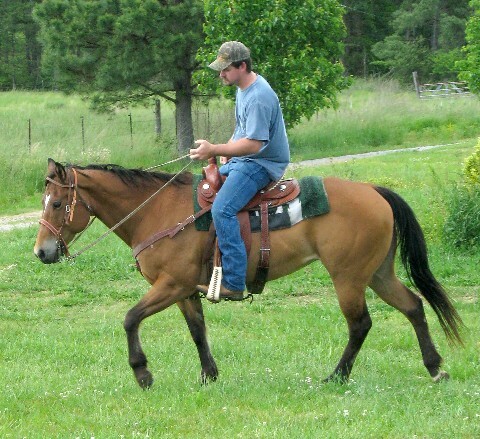 Scout was sold as a weanling to a great lady in GA. She has raised and trained him and broke him to ride. He has great manners and is quite the gentleman. We purchased him back in 2009 and have taken him on many rides since then. He rides well, has a great smooth trot and lope, and seems to be a good fit for my green "senior" aged mother to learn the ropes on. 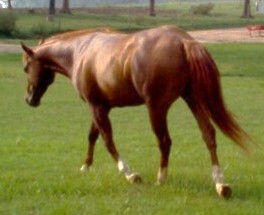 Hustler as a 2 year old with his cutting trainer. We have lost two great friends and I am just now able to post it online. ;-( These boys are terribly missed. They were like part of our family and their loss will always be a gaping hole in our hearts. 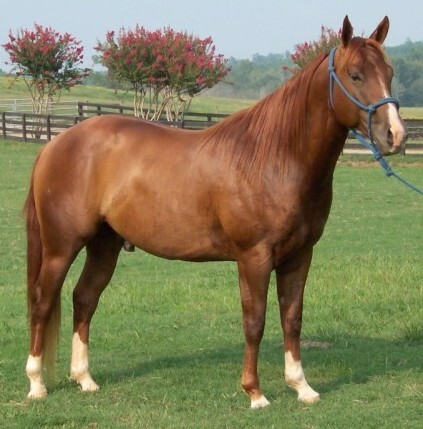 He is sired by Luckys Raindance Kid, who several of our older riding geldings: Ima Peppy Outlaw, Lucky Genuine Cowboy, Lucky Chance Kid, and Lucky Lil Scout are sired by. Lucky produces some of the smartest, kindest babies out there. No buck at all in them and they take to riding like they already knew what you were asking them to do. His bloodlines include Skipper W, Wimpy, and Leo. This one is going to be Chase's someday. Everyone loves him and he is growing off to be a beautiful horse. He has an excellent mind and is a quick learner and is laid back enough that he should make a good horse for Chase in a few more years. 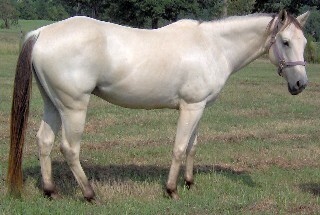 Heza Lucky Hancock(Canyon) ~ AQHA 2010 Dun Roan Gelding ~ NFQHA Eligible Small Star and 3 pasterns white, spot of white on right rear coronary band. 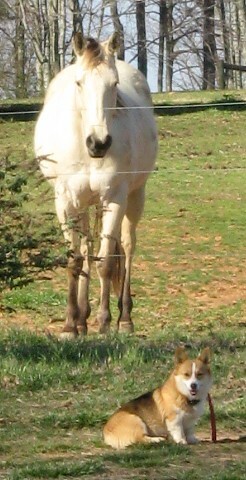 This colt is by Luckys Hustler(now one of our geldings), a perlino son of our Luckys Raindance Kid. On the bottom side Hustler is Border Express, Special Effort and Easily Smashed bred. On the bottom Canyon is by Mico Diamond Hancock. 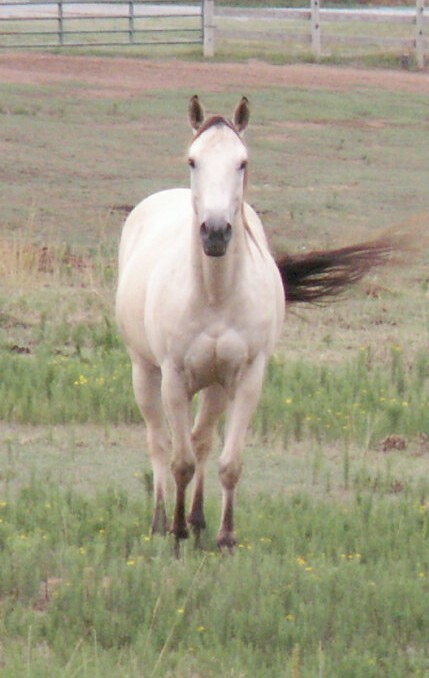 Her bloodlines include Cactus Ben, Blondys Dude and Hancock, Otoe and Oklahoma Star. 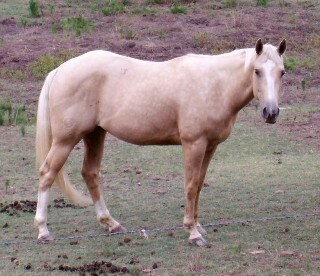 Canyon has been leased to a friend who has been roping and riding him the past 2 years. Once we get him home, I'll post current pics of him here. 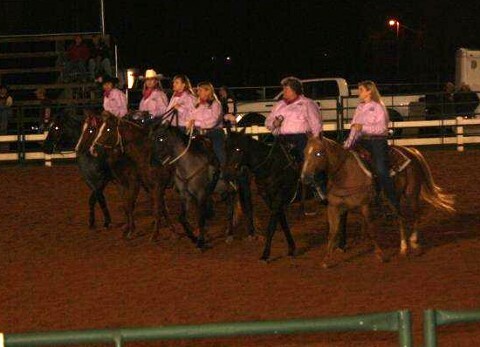 Candi, Tough, & the NFCC Drill Team. Thanks so much girls for all the fun. I loved every minute.